Late spring is elderflower season! The frothy white panicles of flowers are showing up in waysides, fencerows and wild areas all over the state. Get them while you can and savor their heady lychee/pear/peach aroma and flavor. If you miss the elderflowers, don’t despair — the berries are soon to follow. You should only eat the flowers and berries of elder plants. Below are a few of my favorite elderflower and elderberry recipes. Enjoy! Sift flour into mixing bowl. Place beaten egg into well in center of flour. With a spoon or whisk, begin incorporating flour into egg, adding splashes of club soda as you go until you attain a batter with the consistency of heavy cream. For a light, delicate batter, use more liquid; for a heavier, cake-like batter, use less. Allow batter to rest in refrigerator for a minimum of 15 minutes. Stir in additional club soda if batter becomes too thick. Heat 1 to 2 inches of oil to 350 to 375 degrees. Holding elderflower heads by stem, dip into batter, shake off excess, lay into hot oil and fry until golden, turning once. Eating Tips: Pull flowers from stems with fork as you eat them, leaving the stems behind. Suggestion: Serve with fresh strawberries and cream and elderflower champagne cocktail (recipe below). Sterilize a 1 liter canning jar and lid in a hot water bath, drain and lightly pack the fresh elderflowers and lemon zest into the warm jar. Fill to the rim (leaving no airspace) with the vodka, screw on lid and place in a dark, dry area, such as a cupboard. Infuse for a minimum of 48 hours or up to 5 days, gently shaking the jar a few times each day. Strain twice through two layers of clean muslin. Decant into a bottle with tight fitting lid. Suggestions: Sip as a delicious cordial, use as a flavoring in mixed drinks, or use to flavor sparkling water or champagne cocktail. 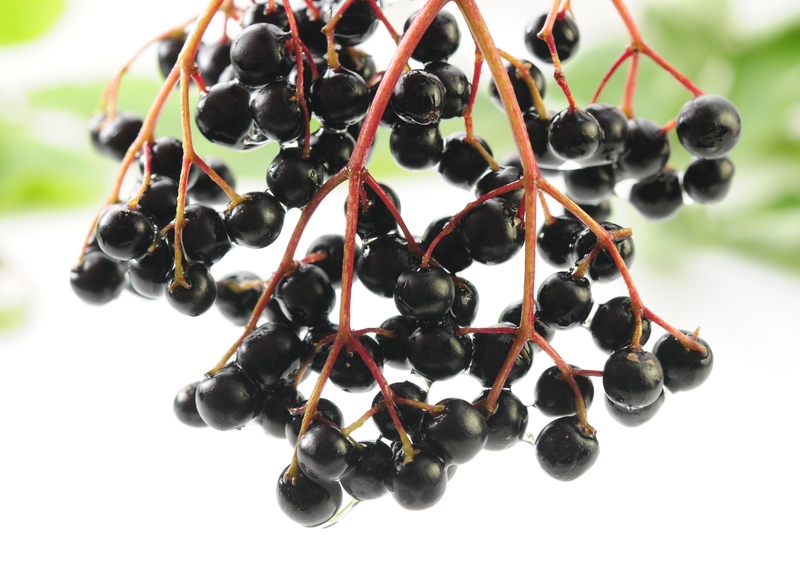 When making elderberry syrup, the quantity of syrup this recipe makes depends on the plumpness of your berries. Place clean berries in medium saucepan and thoroughly mash them with a potato masher or a few quick whirs with an immersion blender, being careful not to break open the bitter seeds. Bring to a gentle boil over medium heat, stirring often. When the berries are fully broken down, remove from heat and run through a food mill or fine mesh sieve to separate all of the juice from the pulp and seeds. Return juice to clean pan and add an equal measure of sugar. Bring mixture to a low boil over medium heat, cooking just until mixture becomes frothy. Remove from heat. Pour hot syrup into sterilized jars. Adjust lids. Process in boiling water for 5 minutes. Remove jars; cool and store. Alternate method: After step 5, pour hot syrup into jars and allow to cool. Store in the refrigerator for up to six months. Suggestions: This syrup can serve as a base for everything from ice cream topping, to frozen sorbet concentrate, and pancake and waffle topping. Stir into iced tea, and even use it to create a sauce for wild game. What do you make with elderflowers and elderberries? This entry was posted in In the kitchen, Natural health and tagged elder, elderberry, elderflower, year of the elder by Cayenne Room. Bookmark the permalink. 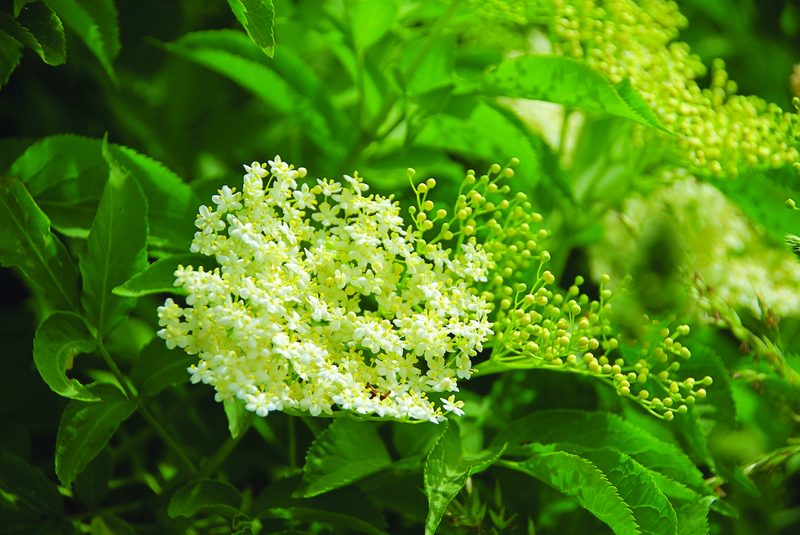 There are a number of medieval recipes using elderflowers. I use dried elderflower (attainable at health food stores) with broth for a different mush sort of a dish (polenta-like, but much tastier).